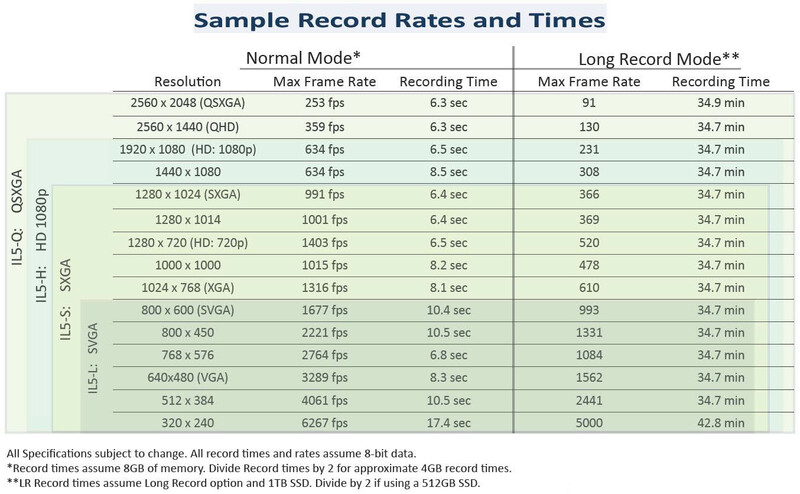 Standard Record Mode: Classic High-Speed Imaging – The IL5-H records beautifully sharp 1920 x 1080 video at 634 frames per second, while the IL5-Q records amazing 2560 x 1440 video at 359fps, in vivid color or monochrome. Smaller resolutions may be recorded at faster frame rates: 720p @ 1400fps, 800 x 600 @ 1677fps, etc. Binning and sub-sampling features of the sensor give the IL5 great flexibility and sensitivity. Flexible Control – The IL5 can be controlled over Gigabit Ethernet via Fastec FasMotion software on your PC/Mac or via the built-in web interface with your favorite web browser on your PC, Mac, tablet, or even your smartphone. Long Record Option – With recording speeds of over 200 frames per second at HD 1080p resolution and 1405 fps at VGA resolution to the built-in SSD, the Fastec IL5 lets you see what you have been missing with normal-speed video. 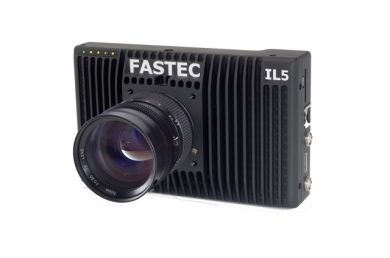 Unlike traditional high-speed camera systems that only record for a few seconds and require careful triggering, the Fastec IL5 with LR option can record at high speed for many minutes at high resolutions, to many hours at reduced resolutions. FasFire Mode – Ultra-fast save times to an SSD or SD card while recording high-speed bursts of hundreds or even thousands of images at a time, the IL5 is always ready for the next highspeed snapshot! FasCorder Mode – Operate the camera as you would a common camcorder! This intuitive Long Record feature allows you to record and pause as needed to follow the action, stop recording and review what you have, and then append additional footage at will, even after a power cycle. Choose between Record on Command (ROC), which records varying length clips, or Burst Record on Command (BROC), which records fixed-length clips. In Playback, all of the recordings are browsable on the timeline. You may play or scrub through them continuously or jump to the beginning of each, making it easy to find the footage you wish to view. Multiple Storage Options – The IL5 features both a USB port and an SD port for quick and easy image downloads to USB flash drives, SD cards, or portable hard drives. The optional built-in SSD (solid state drive) provides up to 1TB of lightning-fast non-volatile internal storage. High-Performance Image Transfer – FasMotion camera control, running on a PC or Mac makes workflow a breeze with image transfer rates of up to 90MB/sec, depending on image size, file type, and computer performance.